My apologies for the absence of posts in the last few days, which have been amongst the most stressful of my sheltered life. This stress was primarily caused by the discovery that our good value campsite was not licenced. We had to leave immediately, for a more expensive campsite. Having spent 1000 pounds and much effort on transforming a field into a comfortable camp site, the team were utterly demoralised. We set about dismantling our achievement. Tempers frayed and soon 3m cubed of portable toilets and digging equipment piled up at the side of the road as the skies turned to a heavy grey. Eight hours later I arrived myself at the new camp site and came across a field occupied by our distinctive blue tents and a thoroughly exhausted team strewn out over the few folding chairs that had not broken, amidst piles of our boggled and dirty equipment. At that point the air was ominously heavy. I sprang into dynamic dictator mode and ran about yelling at the students to get the equipment into the one chalet we had hired. I thought this might be the end of the project. Most of the students seem never to have seen a mediterranean thunderstorm there was a real risk of damage. But practically everything got under cover in time – before over a bucketfull of water came tumbling down and spectacular lightning made direct strikes on teees in our campsite, to the sound of deafening bangs. Yet the intense downpour was not enough to break the big blue tents which I had bought for 50 quid each on amazon. Unfortunately Axel Gering the project co-director was not so lucky. His tent had accidentally been left open and duly received a soaking, to his books, computer and most seriously to the project food receipts he had hoped to have reimbursed. He sat on the wet ground in the dark in despair eventually retreating to the relative comfort of his car and a bottle of red wine. It was the worst day he had had for a long time. In the dry chalet i was greeted by chaos, and part of the team – including my wife, who wished to leave on the next available flight. There was nothing to clean anything with or restore a semblance of normality – all cleaning stuff was mixed up with our various hurriedly gathered possessions. I was desperate to stop this happening so flew into a tidying frenzy in an attempt to restore morale. The catalyst for action was a cup of washing up liquid borrowed from a neighbour and then cleaning began.A promise of 1,000 pounds emergency money from Kent arrived which has enabled us to cover the cost of the campsite. Then today a private donation was promised which will help significantly to restore our dented bank balances – as the project has had an overspend of around 5000 pounds due to the various trials and tribulations we have faced. I think all our credit cards had now stopped working and this will enable us to keep students both fed and housed for the next two weeks. But despite all this the digging is progressing. Work on the facade of the entrance has been particularly spectacular. Cleaning is now complete and the phasing is becoming clearer. Drawing is underway. Here we are dealing with a vaulted entrance hall with monumental steps entering up from the main street, between piers that porbably carried arcaded entrances and were possibly graced by a columnart facade and pieces of statuary, found on the street surface infront. There seems to have been a phase of shops in the early second century which were replaced by the present portico which may be third or early fourth century. This portico is associated with a series of re-used travertine blocks lying in front of the pier of each portico. We hope to date them easily as the foundation trench of one such base was celarly visible and full of finds. 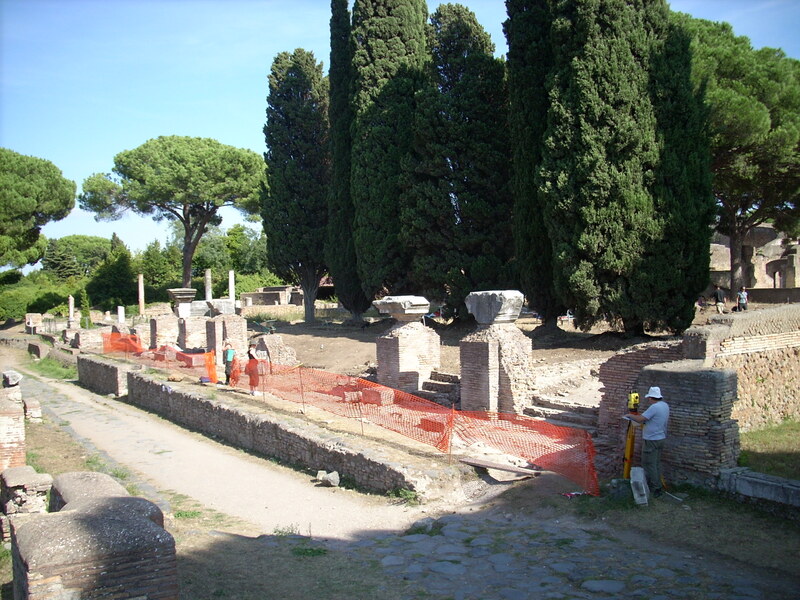 Finally we have noticed that in a later phase of the forum complex the inner piers of the hall were demolished to create extra space on the forum, though the facade itself was retained. 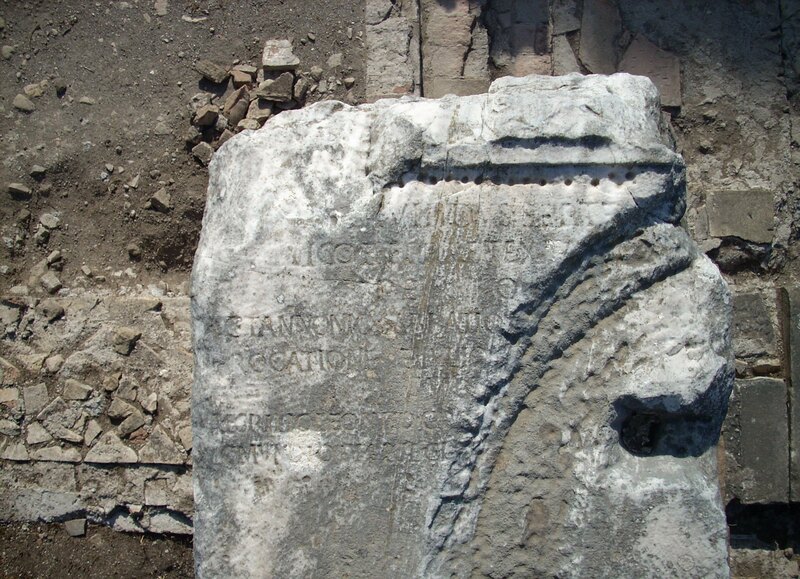 We have a specialist studying the columned architecture of the facade, which has revealled a third century inscription re-used as part of an architrave. Elsewhere on site cleaning of the one area of surviving paving has revealled 4th c. coins- more nummi, whilst visitors are increasingly impresed by our collection of small finds, especially the glass. Hopefully we can get pictures on the blog relatively soon. A spectacular new inscription deserves a page of its own. Sorry to hear that things aren’t going as smoothly as you’d all hoped. The site appears to be producing some interesting features. I look forward to the next installment.